Have you ever wondered what goes into putting on a new shingled roof? Are there layers between the roof decking and the shingles? If so, what are they? An important component of making your roof less prone to leaks caused by ice damming is an ice and water shield. This is a code requirement in cold weather states. If you have a more complicated roof with valleys, skylights, dormers, vent pipes or chimneys, it’s a good idea to have ice and water shield installed in and around these areas as well as along the eves. 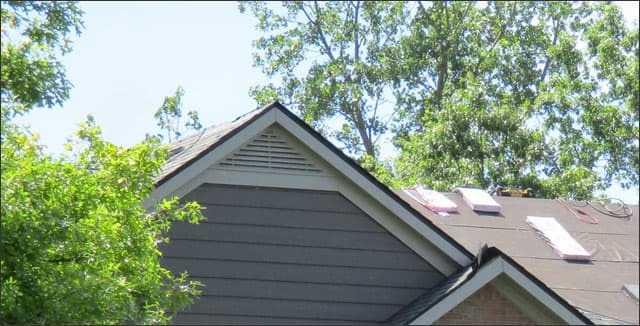 Chronic problem areas of your roof like skylights, dormers, vent pipes, chimneys, and other areas covered by flashing. The ice and water shield is an amazing roofing product that was first introduced in the 1980s. If you have a roof that you know to be older than 1980, it won’t have this great product under the shingles. After that time, it quickly came to be used by most companies to create better roofing systems, whatever the weather. If you see ice and water shield being installed, you might think it is felt paper. Felt paper or tar paper is also a rolled material you see roofers nailing down under shingles. It’s an asphalt saturated paper that increases the water resistance of your roof from wind driven rains or blow offs. Felt paper is also code, and many states have varying requirements as to its application. Felt paper relies mainly on gravity to do its job helping to keep water out of your roof. It is effective when installed properly – in layers. Nail holes from shingles can pose a problem with felt paper, as any holes become vulnerable to seepage. It also can’t protect against any water that flows upward toward the top of your roof, like ice and water dams or heavy rain and wind storms. Synthetic underlayment, like an ice and water shield, is quite a bit lighter, rolls out in large rolls, and is made of polypropylene, fiberglass, polyethylene, and polyester. It is a lot more efficient at preventing leaks and is thinner. Synthetics hold up better in the case of blow offs because they don’t tear like felt paper can. While they don’t seal the nails as ice and water shield does it is a superior underlayment when compared to traditional felt paper. Synthetic “felt” is better at protecting your roof in the event of blow offs or wind driven rain, as it is not as prone to the same problems as felt paper. It will keep your roof dry even when water flows backward and in driving rain. It lasts longer and degrades more slowly than an asphalt product and is safer and easier to install. However, it is more expensive. Ice and water shield is a great product that can be used in spots to protect the most vulnerable areas of your roof, or as a whole-roof underlayment to protect from ice dams, water dams, storms, and leaking in any area of the country and any weather. If you would like to learn more, have questions, or would like to schedule a new roof, please contact us. Can roll roofing combined with a roofing tar be used in place of snow and ice shield? S&I shield is beyond outrageously priced. Absolutely not… Ice and water shield is a rubberized modified asphalt roll meant to continually flex and re-seal. Roofing cement and roll roofing will dry out and not maintain its seal around nails etc. Is it recommended to apply both ice and water shield and roof underlayment or ice and water shield is enough? I have two contractors contacted for my roof but one suggested to have ice & water shield only while the other have both. Great question! Ice and water shield on eves and valley per local code minimum 24″ inside of warm wall. I would recommend 3-4′ inside of warm wall then underlayment felt or synthetic felt to lap on top of ice and water shield 6″ to cover to ridge line. Is Ice & Water required in warm, dry climates like the desert? Or, can I just use a synthetic underlayment across the entire roof and then apply the shingles? Ice and water shield would be a requirement of the building department. Check with your local building department.